A family safari can be a breeze if you choose the right destination - KwaZulu-Natal offers a great climate, bush and beach options, Big Five game plus plenty to do. Here are our top 5 safari lodges for excellent family holidays. There is a wonderful range of children's attractions that Kwazulu-Natal has to offer. From trips to Lake St. Lucia to educational wildlife experiences at Hluhluwe-Imfolozi Park, the little ones will be spoiled for choice at the sights and sounds of this child-friendly destination. Make the most of your days in the bush and enjoy fine hospitality combined with exciting activities. You can spend quality time with your family on a variety of adventures or relax at the lodge in comfort. Great facilities and fun Kids Clubs ensure that your children are entertained while you have some time off. In the heart of Zululand yet close to all major attractions in the area, Bayete Zulu Lodge is a great place for a family safari with an excellent range of bush and beach activities. Your kids can also join in at the Pumba Club which is just the spot for climbing jungle gyms and jumping on the trampoline or having fun on the swings, seesaws and in the tree-house. Kids that are too cool for school can relax in the Club TV lounge where there are play-stations or spend time at the pool. Your kids will love the Wild Cat Rehabilitation Centre! The centre offers great tours and talks as well as viewing of the cats during feeding time in the afternoon. Get up close and personal with Cheetah, Caracal, Serval and African Wild Cat. Emdoneni is child-friendly with a range of facilities which include a game park, walking and hiking trails, a restaurant and pool. The kids programme is jam packed with fun things to do such as adventure game drives and night drives, bush walks, poop spotting and animal tracking, star gazing, bug collecting and more - whew! Enjoy a comfortable and spacious family chalet at Hluhluwe River Lodge. Families who love to do adventurous outdoor activities together will be in their element here. The lodge is near Big Five game parks and the scenic Lake St Lucia. Top activities include mountain bike trails (with bikes and gear supplied plus a picnic), horseback trails, birding boat tours, self-guided walks, and game drives in the Hluhluwe iMfolozi Game Reserve. At Thanda you can expect a wonderful safari where the motto is "for the love of nature, wildlife and dear ones". Thanda offers exciting game drives, bush meals and bush walks as well as a huge array of superb things to do on both land and sea - there will never be a dull moment! Kids of all ages are well catered for with the Bucks and Bugs Club and the Junior Ranger Programme. Your children can explore the environment and have lots of fun at the same time with their ranger and tracker. The library has a range of kid's books, videos and DVD's, games and puzzles. If you are looking for a superb bush and beach destination with a wide choice of activities, this is the place. Families can enjoy game drives, bush walks, boating and canoeing plus many other activities in the vicinity such as snorkelling and seasonal turtle walks. 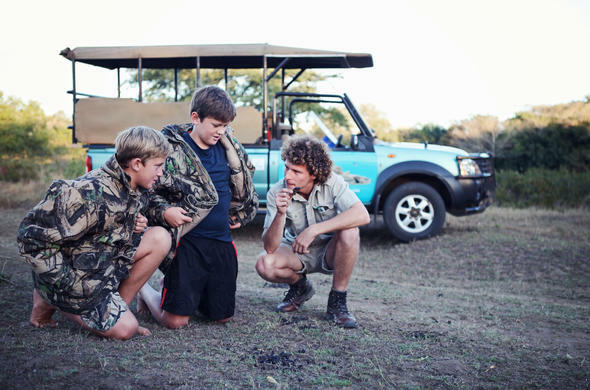 Alternately, a tailor-made family safari option is available in this award-winning reserve with a dedicated ranger and activities planned around your children's ages and interests.